Keyless Start, Bluetooth, TRANSMISSION: 8-SPEED AUTOMATIC (8HP7. ENGINE: 5.7L V8 HEMI MDS VVT, Trailer Hitch, iPod/MP3 Input, Back-Up Camera. EPA 22 MPG Hwy/15 MPG City! WHY BUY FROM US Here at Allen Samuels Chrysler Dodge Jeep Ram, We're Home to New & Used Cars, Parts & Service, and Financing in Hutchinson. Those in search of a new Chrysler, Dodge, Jeep and RAM vehicle in Hutchinson, Wichita, Park City, Newton, and McPherson don't need to look any further. Here at our dealership, we have a wide selection of vehicles to choose from, and a team of specialists who have the knowledge and expertise to assist you throughout your car buying experience. OPTION PACKAGES ENGINE: 5.7L V8 HEMI MDS VVT HEMI badge, GVWR: 6,900 lbs, Heavy Duty Engine Cooling, 26 Gallon Fuel Tank, Active Noise Control System, TRANSMISSION: 8-SPEED AUTOMATIC (8HP75). Fuel economy calculations based on original manufacturer data for trim engine configuration. IPod/MP3 Input, Keyless Start, Back-Up Camera, TRANSMISSION: 8-SPEED AUTOMATIC (850R. QUICK ORDER PACKAGE 23Z BIG HORN/LONE. BIG HORN LEVEL 1 EQUIPMENT GROUP, Aluminum Wheels, Trailer Hitch. FUEL EFFICIENT 25 MPG Hwy/20 MPG City! WHY BUY FROM US Here at Allen Samuels Chrysler Dodge Jeep Ram, We're Home to New & Used Cars, Parts & Service, and Financing in Hutchinson. Those in search of a new Chrysler, Dodge, Jeep and RAM vehicle in Hutchinson, Wichita, Park City, Newton, and McPherson don't need to look any further. Here at our dealership, we have a wide selection of vehicles to choose from, and a team of specialists who have the knowledge and expertise to assist you throughout your car buying experience. OPTION PACKAGES BIG HORN LEVEL 1 EQUIPMENT GROUP Rear Window Defroster, Cluster 3.5 TFT Color Display, Power 8-Way Driver Seat, Rear Power Sliding Window, Sun Visors w/Illuminated Vanity Mirrors, Glove Box Lamp, Integrated Center Stack Radio, Class IV Receiver Hitch, Single Disc Remote CD Player, Power 4-Way Driver Lumbar Adjust, Power Adjustable Pedals, Foam Bottle Insert (Door Trim Panel), Google Android Auto, For More Info, Call 800-643-2112, Exterior Mirrors Courtesy Lamps, 1-Year SiriusXM Radio Service, Auto Dim Exterior Driver Mirror, Radio: Uconnect 4 w/8.4 Display, SiriusXM Satellite Radio, Exterior Mirrors w/Supplemental Signals, Big Horn IP Badge, Rear Dome w/On/Off Switch Lamp, Universal Garage Door Opener, Power Heated Fold Away Mirrors, Rear View Auto Dim Mirror, 8.4 Touchscreen Display, ENGINE: 3.6L V6 24V VVT ETORQUE UPG I (STD), TRANSMISSION: 8-SPEED AUTOMATIC (850RE) (STD), QUICK ORDER PACKAGE 23Z BIG HORN/LONE STAR Engine: 3.6L V6 24V VVT eTorque UPG I, Transmission: 8-Speed Automatic (850RE), Steering Wheel Mounted Audio Controls. Fuel economy calculations based on original manufacturer data for trim engine configuration. IPod/MP3 Input, Keyless Start, Back-Up Camera, TRANSMISSION: 8-SPEED AUTOMATIC (850R. QUICK ORDER PACKAGE 23Z BIG HORN/LONE. BIG HORN LEVEL 1 EQUIPMENT GROUP, Aluminum Wheels, Hitch. FUEL EFFICIENT 25 MPG Hwy/20 MPG City! WHY BUY FROM US Here at Allen Samuels Chrysler Dodge Jeep Ram, We're Home to New & Used Cars, Parts & Service, and Financing in Hutchinson. Those in search of a new Chrysler, Dodge, Jeep and RAM vehicle in Hutchinson, Wichita, Park City, Newton, and McPherson don't need to look any further. Here at our dealership, we have a wide selection of vehicles to choose from, and a team of specialists who have the knowledge and expertise to assist you throughout your car buying experience. OPTION PACKAGES BIG HORN LEVEL 1 EQUIPMENT GROUP Rear Window Defroster, Cluster 3.5 TFT Color Display, Power 8-Way Driver Seat, Rear Power Sliding Window, Sun Visors w/Illuminated Vanity Mirrors, Glove Box Lamp, Integrated Center Stack Radio, Class IV Receiver Hitch, Single Disc Remote CD Player, Power 4-Way Driver Lumbar Adjust, Power Adjustable Pedals, Foam Bottle Insert (Door Trim Panel), Google Android Auto, For More Info, Call 800-643-2112, Exterior Mirrors Courtesy Lamps, 1-Year SiriusXM Radio Service, Auto Dim Exterior Driver Mirror, Radio: Uconnect 4 w/8.4 Display, SiriusXM Satellite Radio, Exterior Mirrors w/Supplemental Signals, Big Horn IP Badge, Rear Dome w/On/Off Switch Lamp, Universal Garage Door Opener, Power Heated Fold Away Mirrors, Rear View Auto Dim Mirror, 8.4 Touchscreen Display, ENGINE: 3.6L V6 24V VVT ETORQUE UPG I (STD), TRANSMISSION: 8-SPEED AUTOMATIC (850RE) (STD), QUICK ORDER PACKAGE 23Z BIG HORN/LONE STAR Engine: 3.6L V6 24V VVT eTorque UPG I, Transmission: 8-Speed Automatic (850RE), Steering Wheel Mounted Audio Controls. Fuel economy calculations based on original manufacturer data for trim engine configuration. FUEL EFFICIENT 22 MPG Hwy/15 MPG City! Back-Up Camera, iPod/MP3 Input, Keyless Start, TRANSMISSION: 8-SPEED AUTOMATIC (8HP7. BIG HORN LEVEL 1 EQUIPMENT GROUP, QUICK ORDER PACKAGE 25Z BIG HORN/LONE. ANTI-SPIN DIFFERENTIAL REAR AXLE WHY BUY FROM US Here at Allen Samuels Chrysler Dodge Jeep Ram, We're Home to New & Used Cars, Parts & Service, and Financing in Hutchinson. Those in search of a new Chrysler, Dodge, Jeep and RAM vehicle in Hutchinson, Wichita, Park City, Newton, and McPherson don't need to look any further. Here at our dealership, we have a wide selection of vehicles to choose from, and a team of specialists who have the knowledge and expertise to assist you throughout your car buying experience. OPTION PACKAGES ENGINE: 5.7L V8 HEMI MDS VVT HEMI badge, Dual Rear Exhaust w/Bright Tips, GVWR: 6,900 lbs, 180 Amp Alternator, Heavy Duty Engine Cooling, 26 Gallon Fuel Tank, Active Noise Control System, BIG HORN LEVEL 1 EQUIPMENT GROUP Rear Window Defroster, Cluster 3.5 TFT Color Display, Power 8-Way Driver Seat, Rear Power Sliding Window, Sun Visors w/Illuminated Vanity Mirrors, Glove Box Lamp, Integrated Center Stack Radio, Class IV Receiver Hitch, Single Disc Remote CD Player, Power 4-Way Driver Lumbar Adjust, Power Adjustable Pedals, Foam Bottle Insert (Door Trim Panel), Google Android Auto, For More Info, Call 800-643-2112, Exterior Mirrors Courtesy Lamps, 1-Year SiriusXM Radio Service, Auto Dim Exterior Driver Mirror, Radio: Uconnect 4 w/8.4 Display, SiriusXM Satellite Radio, Exterior Mirrors w/Supplemental Signals, Big Horn IP Badge, Rear Dome w/On/Off Switch Lamp, Universal Garage Door Opener, Power Heated Fold Away Mirrors, Rear View Auto Dim Mirror, 8.4 Touchscreen Display, ANTI-SPIN DIFFERENTIAL REAR AXLE, QUICK ORDER PACKAGE 25Z BIG HORN/LONE STAR Engine: 5.7L V8 HEMI MDS VVT, Transmission: 8-Speed Automatic (8HP75) Fuel economy calculations based on original manufacturer data for trim engine configuration. EPA 22 MPG Hwy/15 MPG City! Back-Up Camera, iPod/MP3 Input, Keyless Start, TRANSMISSION: 8-SPEED AUTOMATIC (8HP7. BIG HORN LEVEL 1 EQUIPMENT GROUP, QUICK ORDER PACKAGE 25Z BIG HORN/LONE. ANTI-SPIN DIFFERENTIAL REAR AXLE, Hitch WHY BUY FROM US Here at Allen Samuels Chrysler Dodge Jeep Ram, We're Home to New & Used Cars, Parts & Service, and Financing in Hutchinson. Those in search of a new Chrysler, Dodge, Jeep and RAM vehicle in Hutchinson, Wichita, Park City, Newton, and McPherson don't need to look any further. Here at our dealership, we have a wide selection of vehicles to choose from, and a team of specialists who have the knowledge and expertise to assist you throughout your car buying experience. OPTION PACKAGES ENGINE: 5.7L V8 HEMI MDS VVT HEMI badge, Dual Rear Exhaust w/Bright Tips, GVWR: 6,900 lbs, 180 Amp Alternator, Heavy Duty Engine Cooling, 26 Gallon Fuel Tank, Active Noise Control System, BIG HORN LEVEL 1 EQUIPMENT GROUP Rear Window Defroster, Cluster 3.5 TFT Color Display, Power 8-Way Driver Seat, Rear Power Sliding Window, Sun Visors w/Illuminated Vanity Mirrors, Glove Box Lamp, Integrated Center Stack Radio, Class IV Receiver Hitch, Single Disc Remote CD Player, Power 4-Way Driver Lumbar Adjust, Power Adjustable Pedals, Foam Bottle Insert (Door Trim Panel), Google Android Auto, For More Info, Call 800-643-2112, Exterior Mirrors Courtesy Lamps, 1-Year SiriusXM Radio Service, Auto Dim Exterior Driver Mirror, Radio: Uconnect 4 w/8.4 Display, SiriusXM Satellite Radio, Exterior Mirrors w/Supplemental Signals, Big Horn IP Badge, Rear Dome w/On/Off Switch Lamp, Universal Garage Door Opener, Power Heated Fold Away Mirrors, Rear View Auto Dim Mirror, 8.4 Touchscreen Display, ANTI-SPIN DIFFERENTIAL REAR AXLE, QUICK ORDER PACKAGE 25Z BIG HORN/LONE STAR Engine: 5.7L V8 HEMI MDS VVT, Transmission: 8-Speed Automatic (8HP75), Steering Wheel Mounted Audio Controls Fuel economy calculations based on original manufacturer data for trim engine configuration. Back-Up Camera, iPod/MP3 Input, Bluetooth, ENGINE: 3.6L V6 24V VVT ETORQUE UPG I. TRANSMISSION: 8-SPEED AUTOMATIC (850R. QUICK ORDER PACKAGE 23Z BIG HORN/LONE. REMOTE START SYSTEM. FUEL EFFICIENT 24 MPG Hwy/19 MPG City! WHY BUY FROM US Here at Allen Samuels Chrysler Dodge Jeep Ram, We're Home to New & Used Cars, Parts & Service, and Financing in Hutchinson. Those in search of a new Chrysler, Dodge, Jeep and RAM vehicle in Hutchinson, Wichita, Park City, Newton, and McPherson don't need to look any further. Here at our dealership, we have a wide selection of vehicles to choose from, and a team of specialists who have the knowledge and expertise to assist you throughout your car buying experience. OPTION PACKAGES REMOTE START SYSTEM, QUICK ORDER PACKAGE 23Z BIG HORN/LONE STAR Engine: 3.6L V6 24V VVT eTorque UPG I, Transmission: 8-Speed Automatic (850RE), Steering Wheel Mounted Audio Controls, ENGINE: 3.6L V6 24V VVT ETORQUE UPG I (STD), TRANSMISSION: 8-SPEED AUTOMATIC (850RE) (STD). Fuel economy calculations based on original manufacturer data for trim engine configuration. Back-Up Camera, iPod/MP3 Input, Keyless Start, Aluminum Wheels, TRANSMISSION: 8-SPEED AUTOMATIC (8HP7. BIG HORN LEVEL 1 EQUIPMENT GROUP, QUICK ORDER PACKAGE 25Z BIG HORN/LONE. Hitch. FUEL EFFICIENT 22 MPG Hwy/15 MPG City! WHY BUY FROM US Here at Allen Samuels Chrysler Dodge Jeep Ram, We're Home to New & Used Cars, Parts & Service, and Financing in Hutchinson. Those in search of a new Chrysler, Dodge, Jeep and RAM vehicle in Hutchinson, Wichita, Park City, Newton, and McPherson don't need to look any further. Here at our dealership, we have a wide selection of vehicles to choose from, and a team of specialists who have the knowledge and expertise to assist you throughout your car buying experience. OPTION PACKAGES ENGINE: 5.7L V8 HEMI MDS VVT Hemi Badge, Dual Rear Exhaust w/Bright Tips, 180 Amp Alternator, 18 Aluminum Spare Wheel, Heavy Duty Engine Cooling, Active Noise Control System, BIG HORN LEVEL 1 EQUIPMENT GROUP Rear Window Defroster, Cluster 3.5 TFT Color Display, Power 8-Way Driver Seat, Rear Power Sliding Window, Sun Visors w/Illuminated Vanity Mirrors, Glove Box Lamp, Integrated Center Stack Radio, Class IV Receiver Hitch, Single Disc Remote CD Player, Power 4-Way Driver Lumbar Adjust, Power Adjustable Pedals, Foam Bottle Insert (Door Trim Panel), Google Android Auto, For More Info, Call 800-643-2112, Exterior Mirrors Courtesy Lamps, 1-Year SiriusXM Radio Service, Auto Dim Exterior Driver Mirror, Radio: Uconnect 4 w/8.4 Display, SiriusXM Satellite Radio, Exterior Mirrors w/Supplemental Signals, Big Horn IP Badge, Rear Dome w/On/Off Switch Lamp, Universal Garage Door Opener, Power Heated Fold Away Mirrors, Rear View Auto Dim Mirror, 8.4 Touchscreen Display, WHEEL TO WHEEL SIDE STEPS, ANTI-SPIN DIFFERENTIAL REAR AXLE, QUICK ORDER PACKAGE 25Z BIG HORN/LONE STAR Engine: 5.7L V8 HEMI MDS VVT, Transmission: 8-Speed Automatic (8HP75) Fuel economy calculations based on original manufacturer data for trim engine configuration. 4x4, Back-Up Camera, iPod/MP3 Input, Tow Hitch, TRANSMISSION: 8-SPEED AUTOMATIC (8HP7. BIG HORN LEVEL 1 EQUIPMENT GROUP, QUICK ORDER PACKAGE 25Z BIG HORN/LONE. ANTI-SPIN DIFFERENTIAL REAR AXLE. EPA 21 MPG Hwy/15 MPG City! WHY BUY FROM US Here at Allen Samuels Chrysler Dodge Jeep Ram, We're Home to New & Used Cars, Parts & Service, and Financing in Hutchinson. Those in search of a new Chrysler, Dodge, Jeep and RAM vehicle in Hutchinson, Wichita, Park City, Newton, and McPherson don't need to look any further. Here at our dealership, we have a wide selection of vehicles to choose from, and a team of specialists who have the knowledge and expertise to assist you throughout your car buying experience. OPTION PACKAGES WHEELS: 20 X 9 ALUMINUM CHROME CLAD, ENGINE: 5.7L V8 HEMI MDS VVT HEMI badge, Dual Rear Exhaust w/Bright Tips, GVWR: 7,100 lbs, 180 Amp Alternator, Heavy Duty Engine Cooling, 26 Gallon Fuel Tank, Active Noise Control System, BIG HORN LEVEL 1 EQUIPMENT GROUP Rear Window Defroster, Cluster 3.5 TFT Color Display, Power 8-Way Driver Seat, Rear Power Sliding Window, Sun Visors w/Illuminated Vanity Mirrors, Glove Box Lamp, Integrated Center Stack Radio, Class IV Receiver Hitch, Single Disc Remote CD Player, Power 4-Way Driver Lumbar Adjust, Power Adjustable Pedals, Foam Bottle Insert (Door Trim Panel), Google Android Auto, For More Info, Call 800-643-2112, Exterior Mirrors Courtesy Lamps, 1-Year SiriusXM Radio Service, Auto Dim Exterior Driver Mirror, Radio: Uconnect 4 w/8.4 Display, SiriusXM Satellite Radio, Exterior Mirrors w/Supplemental Signals, Big Horn IP Badge, Rear Dome w/On/Off Switch Lamp, Universal Garage Door Opener, Power Heated Fold Away Mirrors, Rear View Auto Dim Mirror, 8.4 Touchscreen Display, ANTI-SPIN DIFFERENTIAL REAR AXLE, REMOTE START SYSTEM, QUICK ORDER PACKAGE 25Z BIG HORN/LONE STAR Engine: 5.7L V8 HEMI MDS VVT Fuel economy calculations based on original manufacturer data for trim engine configuration. Heated Seats, Trailer Hitch, Back-Up Camera, WHEELS: 20 X 9 ALUMINUM CHROME CLAD. TRANSMISSION: 8-SPEED AUTOMATIC (8HP7. BIG HORN LEVEL 2 EQUIPMENT GROUP, QUICK ORDER PACKAGE 25Z BIG HORN/LONE. EPA 22 MPG Hwy/15 MPG City! WHY BUY FROM US Here at Allen Samuels Chrysler Dodge Jeep Ram, We're Home to New & Used Cars, Parts & Service, and Financing in Hutchinson. Those in search of a new Chrysler, Dodge, Jeep and RAM vehicle in Hutchinson, Wichita, Park City, Newton, and McPherson don't need to look any further. Here at our dealership, we have a wide selection of vehicles to choose from, and a team of specialists who have the knowledge and expertise to assist you throughout your car buying experience. OPTION PACKAGES BIG HORN LEVEL 2 EQUIPMENT GROUP Rear Window Defroster, Cluster 7.0 TFT Color Display, Power 8-Way Driver Seat, ParkSense Front/Rear Park Assist w/Stop, Rear Power Sliding Window, Sun Visors w/Illuminated Vanity Mirrors, Heated Steering Wheel, Glove Box Lamp, Integrated Center Stack Radio, 115V Auxiliary Rear Power Outlet, Class IV Receiver Hitch, Single Disc Remote CD Player, Power 4-Way Driver Lumbar Adjust, 2 USB Full Function/Charge Only Media Hub, Heated Front Seats, Power Adjustable Pedals, Foam Bottle Insert (Door Trim Panel), Google Android Auto, Dampened Tailgate, 400W Inverter, 115V Auxiliary Power Outlet, For More Info, Call 800-643-2112, Exterior Mirrors Courtesy Lamps, Auto Dim Exterior Driver Mirror, 1-Year SiriusXM Radio Service, Radio: Uconnect 4 w/8.4 Display, Big Horn, WHEELS: 20 X 9 ALUMINUM CHROME CLAD, ENGINE: 5.7L V8 HEMI MDS VVT HEMI badge, Dual Rear Exhaust w/Bright Tips, GVWR: 6,900 lbs, 180 Amp Alternator, Heavy Duty Engine Cooling, 26 Gallon Fuel Tank, Active Noise Control System, WHEEL TO WHEEL SIDE STEPS, 9 AMPLIFIED SPEAKERS W/SUBWOOFER, ANTI-SPIN DIFFERENTIAL REAR AXLE Fuel economy calculations based on original manufacturer data for trim engine configuration. Heated Seats, Tow Hitch, Back-Up Camera, WHEELS: 20 X 9 ALUMINUM CHROME CLAD. TRANSMISSION: 8-SPEED AUTOMATIC (8HP7. BIG HORN LEVEL 2 EQUIPMENT GROUP, QUICK ORDER PACKAGE 25Z BIG HORN/LONE. FUEL EFFICIENT 22 MPG Hwy/15 MPG City! WHY BUY FROM US Here at Allen Samuels Chrysler Dodge Jeep Ram, We're Home to New & Used Cars, Parts & Service, and Financing in Hutchinson. Those in search of a new Chrysler, Dodge, Jeep and RAM vehicle in Hutchinson, Wichita, Park City, Newton, and McPherson don't need to look any further. Here at our dealership, we have a wide selection of vehicles to choose from, and a team of specialists who have the knowledge and expertise to assist you throughout your car buying experience. OPTION PACKAGES BIG HORN LEVEL 2 EQUIPMENT GROUP Rear Window Defroster, Cluster 7.0 TFT Color Display, Power 8-Way Driver Seat, ParkSense Front/Rear Park Assist w/Stop, Rear Power Sliding Window, Sun Visors w/Illuminated Vanity Mirrors, Heated Steering Wheel, Glove Box Lamp, Integrated Center Stack Radio, 115V Auxiliary Rear Power Outlet, Class IV Receiver Hitch, Single Disc Remote CD Player, Power 4-Way Driver Lumbar Adjust, 2 USB Full Function/Charge Only Media Hub, Heated Front Seats, Power Adjustable Pedals, Foam Bottle Insert (Door Trim Panel), Google Android Auto, Dampened Tailgate, 400W Inverter, 115V Auxiliary Power Outlet, For More Info, Call 800-643-2112, Exterior Mirrors Courtesy Lamps, Auto Dim Exterior Driver Mirror, 1-Year SiriusXM Radio Service, Radio: Uconnect 4 w/8.4 Display, Big Horn, WHEELS: 20 X 9 ALUMINUM CHROME CLAD, ENGINE: 5.7L V8 HEMI MDS VVT HEMI badge, Dual Rear Exhaust w/Bright Tips, GVWR: 6,900 lbs, 180 Amp Alternator, Heavy Duty Engine Cooling, 26 Gallon Fuel Tank, Active Noise Control System, WHEEL TO WHEEL SIDE STEPS, 9 AMPLIFIED SPEAKERS W/SUBWOOFER, ANTI-SPIN DIFFERENTIAL REAR AXLE Fuel economy calculations based on original manufacturer data for trim engine configuration. EPA 21 MPG Hwy/15 MPG City! Back-Up Camera, 4x4, Bluetooth, iPod/MP3 Input, TRADESMAN GROUP , TRANSMISSION: 8-SPEED AUTOMATIC (8HP7. TRADESMAN LEVEL 1 EQUIPMENT GROUP, CHROME APPEARANCE GROUP, Bed Liner, Tow Hitch. WHY BUY FROM US Here at Allen Samuels Chrysler Dodge Jeep Ram, We're Home to New & Used Cars, Parts & Service, and Financing in Hutchinson. Those in search of a new Chrysler, Dodge, Jeep and RAM vehicle in Hutchinson, Wichita, Park City, Newton, and McPherson don't need to look any further. Here at our dealership, we have a wide selection of vehicles to choose from, and a team of specialists who have the knowledge and expertise to assist you throughout your car buying experience. OPTION PACKAGES TRADESMAN LEVEL 1 EQUIPMENT GROUP Rear Power Sliding Window, Carpet Floor Covering, For More Info, Call 800-643-2112, Front & Rear Floor Mats, 1-Year SiriusXM Radio Service, SiriusXM Satellite Radio, ENGINE: 5.7L V8 HEMI MDS VVT Hemi Badge, GVWR: 7,100 lbs, 180 Amp Alternator, Heavy Duty Engine Cooling, Active Noise Control System, CHROME APPEARANCE GROUP Grille Chrome Outline 1 Texture 1, Bright Rear Bumper, Bright Front Bumper, Wheels: 18 x 8 Premium Paint Cast, TRADESMAN GROUP Spray In Bedliner, ANTI-SPIN DIFFERENTIAL REAR AXLE, TRANSMISSION: 8-SPEED AUTOMATIC (8HP75). Fuel economy calculations based on original manufacturer data for trim engine configuration. Heated Seats, 4x4, Back-Up Camera, Tow Hitch, PREMIUM LIGHTING GROUP, BIG HORN NON-BSG LEVEL 2 GROUP W/MEDI. QUICK ORDER PACKAGE 25Z BIG HORN/LONE. SPORT APPEARANCE PACKAGE. FUEL EFFICIENT 21 MPG Hwy/15 MPG City! WHY BUY FROM US Here at Allen Samuels Chrysler Dodge Jeep Ram, We're Home to New & Used Cars, Parts & Service, and Financing in Hutchinson. Those in search of a new Chrysler, Dodge, Jeep and RAM vehicle in Hutchinson, Wichita, Park City, Newton, and McPherson don't need to look any further. Here at our dealership, we have a wide selection of vehicles to choose from, and a team of specialists who have the knowledge and expertise to assist you throughout your car buying experience. OPTION PACKAGES BIG HORN NON-BSG LEVEL 2 GROUP W/MEDIA HUB Rear Window Defroster, Cluster 7.0 TFT Color Display, Power 8-Way Driver Seat, ParkSense Front/Rear Park Assist w/Stop, Rear Power Sliding Window, Sun Visors w/Illuminated Vanity Mirrors, Heated Steering Wheel, Glove Box Lamp, Integrated Center Stack Radio, Class IV Receiver Hitch, Single Disc Remote CD Player, Power 4-Way Driver Lumbar Adjust, 2 USB Full Function/Charge Only Media Hub, Heated Front Seats, Power Adjustable Pedals, Foam Bottle Insert (Door Trim Panel), Google Android Auto, Dampened Tailgate, For More Info, Call 800-643-2112, Exterior Mirrors Courtesy Lamps, Auto Dim Exterior Driver Mirror, 1-Year SiriusXM Radio Service, Radio: Uconnect 4 w/8.4 Display, Big Horn IP Badge, Exterior Mirrors w/Supplemental Signals, SiriusXM Satellite, WHEELS: 20 X 9 ALUMINUM CHROME CLAD, ENGINE: 5.7L V8 HEMI MDS VVT HEMI badge, Dual Rear Exhaust w/Bright Tips, GVWR: 7,100 lbs, 180 Amp Alternator, Heavy Duty Engine Cooling, 26 Gallon Fuel Tank, Active Noise Control System, SPORT APPEARANCE PACKAGE Body Color Door Handles, Tires: 275/55R20 OWL All Season, Grille B/Color Outline 1 Texture 2, Body Color Rear Bumper w/Step Pads Fuel economy calculations based on original manufacturer data for trim engine configuration. Heated Seats, Alloy Wheels, 4x4, Back-Up Camera, BED UTILITY GROUP , TRANSMISSION: 8-SPEED AUTOMATIC (8HP7. QUICK ORDER PACKAGE 25Z BIG HORN/LONE. BIG HORN LEVEL 2 EQUIPMENT GROUP, Bed Liner. FUEL EFFICIENT 21 MPG Hwy/15 MPG City! WHY BUY FROM US Here at Allen Samuels Chrysler Dodge Jeep Ram, We're Home to New & Used Cars, Parts & Service, and Financing in Hutchinson. Those in search of a new Chrysler, Dodge, Jeep and RAM vehicle in Hutchinson, Wichita, Park City, Newton, and McPherson don't need to look any further. Here at our dealership, we have a wide selection of vehicles to choose from, and a team of specialists who have the knowledge and expertise to assist you throughout your car buying experience. OPTION PACKAGES BIG HORN LEVEL 2 EQUIPMENT GROUP Rear Window Defroster, Cluster 7.0 TFT Color Display, Power 8-Way Driver Seat, ParkSense Front/Rear Park Assist w/Stop, Rear Power Sliding Window, Sun Visors w/Illuminated Vanity Mirrors, Heated Steering Wheel, Glove Box Lamp, Integrated Center Stack Radio, 115V Auxiliary Rear Power Outlet, Class IV Receiver Hitch, Single Disc Remote CD Player, Power 4-Way Driver Lumbar Adjust, 2 USB Full Function/Charge Only Media Hub, Heated Front Seats, Power Adjustable Pedals, Foam Bottle Insert (Door Trim Panel), Google Android Auto, Dampened Tailgate, 400W Inverter, 115V Auxiliary Power Outlet, For More Info, Call 800-643-2112, Exterior Mirrors Courtesy Lamps, Auto Dim Exterior Driver Mirror, 1-Year SiriusXM Radio Service, Radio: Uconnect 4 w/8.4 Display, Big Horn, ENGINE: 5.7L V8 HEMI MDS VVT Hemi Badge, Dual Rear Exhaust w/Bright Tips, GVWR: 7,100 lbs, 180 Amp Alternator, Heavy Duty Engine Cooling, Active Noise Control System, BED UTILITY GROUP Pick-Up Box Lighting, Spray In Bedliner, 4 Adjustable Cargo Tie-Down Hooks, ANTI-SPIN DIFFERENTIAL REAR AXLE, QUICK ORDER PACKAGE 25Z BIG HORN/LONE STAR Engine: 5.7L V8 HEMI MDS VVT Fuel economy calculations based on original manufacturer data for trim engine configuration. Heated Seats, Alloy Wheels, 4x4, Back-Up Camera, BED UTILITY GROUP , TRANSMISSION: 8-SPEED AUTOMATIC (8HP7. QUICK ORDER PACKAGE 25Z BIG HORN/LONE. BIG HORN LEVEL 2 EQUIPMENT GROUP, Bed Liner, Tow Hitch. EPA 21 MPG Hwy/15 MPG City! WHY BUY FROM US Here at Allen Samuels Chrysler Dodge Jeep Ram, We're Home to New & Used Cars, Parts & Service, and Financing in Hutchinson. Those in search of a new Chrysler, Dodge, Jeep and RAM vehicle in Hutchinson, Wichita, Park City, Newton, and McPherson don't need to look any further. Here at our dealership, we have a wide selection of vehicles to choose from, and a team of specialists who have the knowledge and expertise to assist you throughout your car buying experience. OPTION PACKAGES BIG HORN LEVEL 2 EQUIPMENT GROUP Rear Window Defroster, Cluster 7.0 TFT Color Display, Power 8-Way Driver Seat, ParkSense Front/Rear Park Assist w/Stop, Rear Power Sliding Window, Sun Visors w/Illuminated Vanity Mirrors, Heated Steering Wheel, Glove Box Lamp, Integrated Center Stack Radio, 115V Auxiliary Rear Power Outlet, Class IV Receiver Hitch, Single Disc Remote CD Player, Power 4-Way Driver Lumbar Adjust, 2 USB Full Function/Charge Only Media Hub, Heated Front Seats, Power Adjustable Pedals, Foam Bottle Insert (Door Trim Panel), Google Android Auto, Dampened Tailgate, 400W Inverter, 115V Auxiliary Power Outlet, For More Info, Call 800-643-2112, Exterior Mirrors Courtesy Lamps, Auto Dim Exterior Driver Mirror, 1-Year SiriusXM Radio Service, Radio: Uconnect 4 w/8.4 Display, Big Horn, ENGINE: 5.7L V8 HEMI MDS VVT Hemi Badge, Dual Rear Exhaust w/Bright Tips, GVWR: 7,100 lbs, 180 Amp Alternator, Heavy Duty Engine Cooling, Active Noise Control System, BED UTILITY GROUP Pick-Up Box Lighting, Spray In Bedliner, 4 Adjustable Cargo Tie-Down Hooks, ANTI-SPIN DIFFERENTIAL REAR AXLE, QUICK ORDER PACKAGE 25Z BIG HORN/LONE STAR Engine: 5.7L V8 HEMI MDS VVT Fuel economy calculations based on original manufacturer data for trim engine configuration. Heated Seats, Hitch, WHEELS: 20 X 9 ALUMINUM CHROME CLAD. Back-Up Camera, 4x4, 9 AMPLIFIED SPEAKERS W/SUBWOOFER, PREMIUM LIGHTING GROUP, PROTECTION GROUP, BIG HORN LEVEL 2 EQUIPMENT GROUP. FUEL EFFICIENT 21 MPG Hwy/15 MPG City! 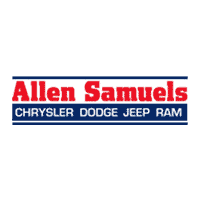 WHY BUY FROM US Here at Allen Samuels Chrysler Dodge Jeep Ram, We're Home to New & Used Cars, Parts & Service, and Financing in Hutchinson. Those in search of a new Chrysler, Dodge, Jeep and RAM vehicle in Hutchinson, Wichita, Park City, Newton, and McPherson don't need to look any further. Here at our dealership, we have a wide selection of vehicles to choose from, and a team of specialists who have the knowledge and expertise to assist you throughout your car buying experience. OPTION PACKAGES BIG HORN LEVEL 2 EQUIPMENT GROUP Rear Window Defroster, Cluster 7.0 TFT Color Display, Power 8-Way Driver Seat, ParkSense Front/Rear Park Assist w/Stop, Rear Power Sliding Window, Sun Visors w/Illuminated Vanity Mirrors, Heated Steering Wheel, Glove Box Lamp, Integrated Center Stack Radio, 115V Auxiliary Rear Power Outlet, Class IV Receiver Hitch, Single Disc Remote CD Player, Power 4-Way Driver Lumbar Adjust, 2 USB Full Function/Charge Only Media Hub, Heated Front Seats, Power Adjustable Pedals, Foam Bottle Insert (Door Trim Panel), Google Android Auto, Dampened Tailgate, 400W Inverter, 115V Auxiliary Power Outlet, For More Info, Call 800-643-2112, Exterior Mirrors Courtesy Lamps, Auto Dim Exterior Driver Mirror, 1-Year SiriusXM Radio Service, Radio: Uconnect 4 w/8.4 Display, Big Horn, WHEELS: 20 X 9 ALUMINUM CHROME CLAD, ENGINE: 5.7L V8 HEMI MDS VVT Hemi Badge, Dual Rear Exhaust w/Bright Tips, GVWR: 7,100 lbs, 180 Amp Alternator, Heavy Duty Engine Cooling, Active Noise Control System, SPORT APPEARANCE PACKAGE Body Color Door Handles, Tires: 275/55R20 OWL All Season, Grille B/Color Outline 1 Texture 2, Body Color Rear Bumper w/Step Pads Fuel economy calculations based on original manufacturer data for trim engine configuration. Heated Seats, Bed Liner, Hitch, Back-Up Camera, 4x4, WHEELS: 20 X 9 ALUMINUM CHROME CLAD. PREMIUM LIGHTING GROUP, SPORT APPEARANCE PACKAGE, QUICK ORDER PACKAGE 25Z BIG HORN/LONE. BED UTILITY GROUP. EPA 21 MPG Hwy/15 MPG City! WHY BUY FROM US Here at Allen Samuels Chrysler Dodge Jeep Ram, We're Home to New & Used Cars, Parts & Service, and Financing in Hutchinson. Those in search of a new Chrysler, Dodge, Jeep and RAM vehicle in Hutchinson, Wichita, Park City, Newton, and McPherson don't need to look any further. Here at our dealership, we have a wide selection of vehicles to choose from, and a team of specialists who have the knowledge and expertise to assist you throughout your car buying experience. OPTION PACKAGES BIG HORN NON-BSG LEVEL 2 GROUP W/MEDIA HUB Rear Window Defroster, Cluster 7.0 TFT Color Display, Power 8-Way Driver Seat, ParkSense Front/Rear Park Assist w/Stop, Rear Power Sliding Window, Sun Visors w/Illuminated Vanity Mirrors, Heated Steering Wheel, Glove Box Lamp, Integrated Center Stack Radio, Class IV Receiver Hitch, Single Disc Remote CD Player, Power 4-Way Driver Lumbar Adjust, 2 USB Full Function/Charge Only Media Hub, Heated Front Seats, Power Adjustable Pedals, Foam Bottle Insert (Door Trim Panel), Google Android Auto, Dampened Tailgate, For More Info, Call 800-643-2112, Exterior Mirrors Courtesy Lamps, Auto Dim Exterior Driver Mirror, 1-Year SiriusXM Radio Service, Radio: Uconnect 4 w/8.4 Display, Big Horn IP Badge, Exterior Mirrors w/Supplemental Signals, SiriusXM Satellite, WHEELS: 20 X 9 ALUMINUM CHROME CLAD, ENGINE: 5.7L V8 HEMI MDS VVT Hemi Badge, Dual Rear Exhaust w/Bright Tips, GVWR: 7,100 lbs, 180 Amp Alternator, Heavy Duty Engine Cooling, Active Noise Control System, SPORT APPEARANCE PACKAGE Body Color Door Handles, Tires: 275/55R20 OWL All Season, Grille B/Color Outline 1 Texture 2, Body Color Rear Bumper w/Step Pads Fuel economy calculations based on original manufacturer data for trim engine configuration. Heated/Cooled Leather Seats, Nav System, Back-Up Camera, Bed Liner, LARAMIE LEVEL 1 EQUIPMENT GROUP , iPod/MP3 Input, Hitch, TRANSMISSION: 8-SPEED AUTOMATIC (8HP7. CHROME APPEARANCE GROUP. FUEL EFFICIENT 22 MPG Hwy/15 MPG City! WHY BUY FROM US Here at Allen Samuels Chrysler Dodge Jeep Ram, We're Home to New & Used Cars, Parts & Service, and Financing in Hutchinson. Those in search of a new Chrysler, Dodge, Jeep and RAM vehicle in Hutchinson, Wichita, Park City, Newton, and McPherson don't need to look any further. Here at our dealership, we have a wide selection of vehicles to choose from, and a team of specialists who have the knowledge and expertise to assist you throughout your car buying experience. OPTION PACKAGES LARAMIE LEVEL 1 EQUIPMENT GROUP Foam Bottle Insert (Door Trim Panel), Rear 60/40 Folding Split Recline Seat, ParkSense Front/Rear Park Assist w/Stop, Auto High Beam Headlamp Control, Rain Sensitive Windshield Wipers, Tailgate Ajar Warning Lamp, Single Disc Remote CD Player, Blind Spot & Cross Path Detection, Remote Tailgate Release, ENGINE: 5.7L V8 HEMI MDS VVT Hemi Badge, 220 Amp Alternator, Dual Rear Exhaust w/Bright Tips, 18 Aluminum Spare Wheel, Heavy Duty Engine Cooling, Active Noise Control System, WHEELS: 20 X 9 PREMIUM PAINT/POLISHED Tires: 275/55R20 OWL All Season, CHROME APPEARANCE GROUP Chrome Tow Hooks, Day Light Opening Moldings, Wheel to Wheel Side Steps, BED UTILITY GROUP Pick-Up Box Lighting, Spray In Bedliner, 4 Adjustable Cargo Tie-Down Hooks, RADIO: UCONNECT 4C NAV W/8.4 DISPLAY SiriusXM Travel Link, 5-Year SiriusXM Travel Link Service, Disassociated Touchscreen Display, 5-Year SiriusXM Traffic Service, 1-YR SiriusXM Guardian Trial, HD Radio, SiriusXM Traffic Plus, For Details, Visit DriveUconnect.com, GPS Navigation, No Satellite Coverage w/HI/AK/PR/VI/GU, ANTI-SPIN DIFFERENTIAL REAR AXLE, TRAILER TOW GROUP Trailer Brake Control Fuel economy calculations based on original manufacturer data for trim engine configuration. Heated/Cooled Leather Seats, Back-Up Camera, iPod/MP3 Input, Hitch, CHROME APPEARANCE GROUP , ADVANCED SAFETY GROUP , LARAMIE LEVEL 2 EQUIPMENT GROUP , TRANSMISSION: 8-SPEED AUTOMATIC (8HP7. FUEL EFFICIENT 22 MPG Hwy/15 MPG City! WHY BUY FROM US Here at Allen Samuels Chrysler Dodge Jeep Ram, We're Home to New & Used Cars, Parts & Service, and Financing in Hutchinson. Those in search of a new Chrysler, Dodge, Jeep and RAM vehicle in Hutchinson, Wichita, Park City, Newton, and McPherson don't need to look any further. Here at our dealership, we have a wide selection of vehicles to choose from, and a team of specialists who have the knowledge and expertise to assist you throughout your car buying experience. OPTION PACKAGES LARAMIE LEVEL 2 EQUIPMENT GROUP Foam Bottle Insert (Door Trim Panel), Rear 60/40 Folding Split Recline Seat, ParkSense Front/Rear Park Assist w/Stop, Auto High Beam Headlamp Control, Rain Sensitive Windshield Wipers, Radio: Uconnect 4C Nav w/8.4 Display, SiriusXM Travel Link, 5-Year SiriusXM Travel Link Service, Disassociated Touchscreen Display, 5-Year SiriusXM Traffic Service, 1-YR SiriusXM Guardian Trial, HD Radio, SiriusXM Traffic Plus, For Details, Visit DriveUconnect.com, GPS Navigation, No Satellite Coverage w/HI/AK/PR/VI/GU, Wireless Charging Pad, Heated Second Row Seats, Remote Tailgate Release, Rear Underseat Compartment Storage, Tailgate Ajar Warning Lamp, harman/kardon 19 Speaker Premium Sound, Single Disc Remote CD Player, Blind Spot & Cross Path Detection, ADVANCED SAFETY GROUP Lane Departure Warning Plus, Auto High Beam Headlamp Control, Parallel & Perp Park Assist w/Stop, Adaptive Cruise Control w/Stop & Go, Advanced Brake Assist, Full Speed Forward Collision Warning Plus, ENGINE: 5.7L V8 HEMI MDS VVT Hemi Badge, 220 Amp Alternator, Dual Rear Exhaust w/Bright Tips, 18 Aluminum Spare Wheel, Heavy Duty Engine Cooling Fuel economy calculations based on original manufacturer data for trim engine configuration. Heated/Cooled Leather Seats, Aluminum Wheels, Bed Liner, Back-Up Camera, 4x4, CHROME APPEARANCE GROUP , BED UTILITY GROUP , LARAMIE LEVEL 2 EQUIPMENT GROUP , TRAILER TOW GROUP , ENGINE: 5.7L V8 HEMI MDS VVT. EPA 21 MPG Hwy/15 MPG City! WHY BUY FROM US Here at Allen Samuels Chrysler Dodge Jeep Ram, We're Home to New & Used Cars, Parts & Service, and Financing in Hutchinson. Those in search of a new Chrysler, Dodge, Jeep and RAM vehicle in Hutchinson, Wichita, Park City, Newton, and McPherson don't need to look any further. Here at our dealership, we have a wide selection of vehicles to choose from, and a team of specialists who have the knowledge and expertise to assist you throughout your car buying experience. OPTION PACKAGES LARAMIE LEVEL 2 EQUIPMENT GROUP Foam Bottle Insert (Door Trim Panel), Rear 60/40 Folding Split Recline Seat, ParkSense Front/Rear Park Assist w/Stop, Auto High Beam Headlamp Control, Rain Sensitive Windshield Wipers, Radio: Uconnect 4C Nav w/8.4 Display, SiriusXM Travel Link, 5-Year SiriusXM Travel Link Service, Disassociated Touchscreen Display, 5-Year SiriusXM Traffic Service, 1-YR SiriusXM Guardian Trial, HD Radio, SiriusXM Traffic Plus, For Details, Visit DriveUconnect.com, GPS Navigation, No Satellite Coverage w/HI/AK/PR/VI/GU, Wireless Charging Pad, Heated Second Row Seats, Remote Tailgate Release, Rear Underseat Compartment Storage, Tailgate Ajar Warning Lamp, harman/kardon 19 Speaker Premium Sound, Single Disc Remote CD Player, Blind Spot & Cross Path Detection, ENGINE: 5.7L V8 HEMI MDS VVT Hemi Badge, 220 Amp Alternator, Dual Rear Exhaust w/Bright Tips, GVWR: 7,100 lbs, Heavy Duty Engine Cooling, Active Noise Control System, CHROME APPEARANCE GROUP Chrome Tow Hooks, Day Light Opening Moldings, Wheel to Wheel Side Steps, BED UTILITY GROUP Pick-Up Box Lighting, Spray In Bedliner, 4 Adjustable Cargo Tie-Down Hooks Fuel economy calculations based on original manufacturer data for trim engine configuration. NAV, Heated Seats, Alloy Wheels, 4x4, iPod/MP3 Input, Back-Up Camera, ENGINE: 5.7L V8 HEMI MDS VVT ETORQUE, BLACK TUBULAR SIDE STEPS, REBEL LEVEL 1 EQUIPMENT GROUP, Bed Liner, Tow Hitch. FUEL EFFICIENT 21 MPG Hwy/15 MPG City! WHY BUY FROM US Here at Allen Samuels Chrysler Dodge Jeep Ram, We're Home to New & Used Cars, Parts & Service, and Financing in Hutchinson. Those in search of a new Chrysler, Dodge, Jeep and RAM vehicle in Hutchinson, Wichita, Park City, Newton, and McPherson don't need to look any further. Here at our dealership, we have a wide selection of vehicles to choose from, and a team of specialists who have the knowledge and expertise to assist you throughout your car buying experience. OPTION PACKAGES ENGINE: 5.7L V8 HEMI MDS VVT ETORQUE 23 Gallon Fuel Tank, Hemi Badge, Dual Exhaust w/Black Tips, GVWR: 7,100 lbs, 18 Aluminum Spare Wheel, Heavy Duty Engine Cooling, Active Noise Control System, REBEL LEVEL 1 EQUIPMENT GROUP Foam Bottle Insert (Door Trim Panel), Rear Window Defroster, Google Android Auto, Sun Visors w/Illuminated Vanity Mirrors, Heated Steering Wheel, Exterior Mirrors Courtesy Lamps, Integrated Center Stack Radio, Auto Dim Exterior Driver Mirror, Radio: Uconnect 4 w/8.4 Display, Exterior Mirrors w/Supplemental Signals, Rear Dome w/On/Off Switch Lamp, Universal Garage Door Opener, Power Heated Fold Away Mirrors, Rear View Auto Dim Mirror, 8.4 Touchscreen Display, Single Disc Remote CD Player, Heated Front Seats, Power-Folding Mirrors, Power Adjustable Pedals, Apple CarPlay, RADIO: UCONNECT 4C NAV W/8.4 DISPLAY SiriusXM Travel Link, Google Android Auto, 5-Year SiriusXM Travel Link Service, Disassociated Touchscreen Display, 5-Year SiriusXM Traffic Service, 1-YR SiriusXM Guardian Trial, HD Radio, SiriusXM Traffic Plus, For Details, Visit DriveUconnect.com, Integrated Center Stack Radio, GPS Navigation Fuel economy calculations based on original manufacturer data for trim engine configuration.